When many of us think about heating, the first thing that springs to mind is the comfort inside of the home. While Warmup products are known and relied upon to heat homes, their unique and exceptional heating properties can also be used outdoors to provide safety and peace of mind. Slip and Fall accidents caused by ice and snow are a leading cause of injury nationwide and cost the country $34 billion annually (Center for Disease Control statistics). The truth is that in some regions, outdoor heat is just as necessary as indoor heat. If you are a home or business owner considering outdoor heat, chances are safety is your biggest concern. Each year in the USA 540,000 patients require hospital care as a result of an injury sustained from a fall. While some falls result in minor injury, one out of every five is much more serious (Center for Disease Control, 2017). It is the shocking truth that slips and falls are responsible for 25,000 fatalities annually in the USA (National Safety Council, 2015). 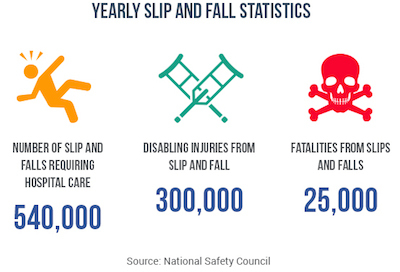 Figure 1: Yearly slip and fall statistics from the National Safety Council. In the winter months, it is common to see a rise in slip and fall injuries because no matter the person, ice and snow do increase risk of injury. The only sure way to decrease an individual’s risk of falling on snow and ice is to limit or eliminate time spent navigating through these conditions. Not everybody is lucky enough to have a snow melting system. Did you know you could volunteer in your city to shovel the snow for your community? When it comes to proactive property management, there is no such thing as being overly precautions. As a home or business owner it is important to be prepared so that you can avoid serious incidents that could lead to lawsuit. Slip and fall accidents are one of the most common causes of accidents that take place on commercial properties and 70% of these accidents occur on flat surfaces. These very situations are responsible for 53% of general liability claims filed against companies (HDK, 2015). No matter the size of your business, these claims can consume significant resources. In 2014, there were 42,480 workplace injuries that involved time away from work due to an accident involving sleet, snow, or ice (Bureau of Labor Statistics, 2014). In addition to the monetary value that a company can become liable for, the loss of employee time at work can also significantly impact an operation. From state to state, varying laws have made the way that we deal with slip and fall accidents a grey area, especially for homeowners. Clearing the walkways and surfaces outside of your home is key to preventing injury and is the responsibility of any homeowner. With this type of responsibility, homeowners in cold areas must decide on a solution for maintaining ice-free entryways if they hope to avoid lawsuit. While there are many options available for snow removal and ice melting, there is only one solution that guarantees total safety: snow melting electric heating cables compatible with concrete, asphalt and pavers. Whether you are considering your own safety or the safety of those who visit your home or business, outdoor heating systems can be designed to ensure that nobody ever has to step foot on a dangerously cold surface. By replacing the process of manual snow removal with the power of an automatic electric system, you grant yourself peace of mind knowing that even when you are not working, your system is. Warmup snow melting systems are designed to be used in conjunction with the DS series of outdoor controls. The DS series of outdoor controls features a dual-sensor that collects temperature data as well as moisture levels to determine the proper time to activate heating. This setup is truly effortless once installed and requires virtually no maintenance. Before Winter comes around again ask yourself: am I doing all that I can to prevent injury at my home/business? By spending time this off season preparing for the inevitable you will save yourself the worry and hassle of manual snow removal in the months to come.